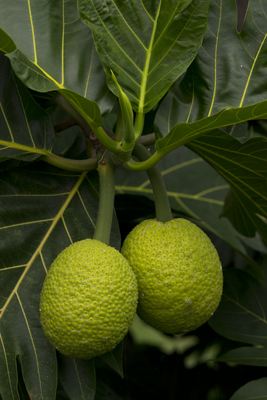 Ripening breadfruit, once a staple of the Hawaiian diet. Keaklakekua, South Kona. BY BARBRA PLEADWELL – Kanu Hawaii and GreenWheel Food Hub are partnering to create a localized “pop-up” farmers market for residents of Kalani Gardens Apartments in Mililani. The market will be the first to accept Supplemental Nutrition Assistance Program through the GreenWheel Grow Bucks Project. This project is part of Kanu Hawaii’s food desert pilot, supported by the Kaiser Permanente, which focuses on communities with limited access to fresh, healthy, local produce. “The ‘pop-up’ concept was inspired by a new trend with restaurants and stores that spring up to fill a need. This kind of farmers market can be customized to fit the community’s needs,” said Lisa Asagi, cofounder of GreenWheel Food Hub and manager of Honolulu Farmers Market. The mobile farmers market will make its debut at a free event on Sunday, April 15 from 2 p.m. – 4:30 p.m. at Kalani Gardens Apartments (95-081 Kipapa Drive, Mililani, HI 96789). The event will feature local chef demonstrations and produce from Mililani farmers.